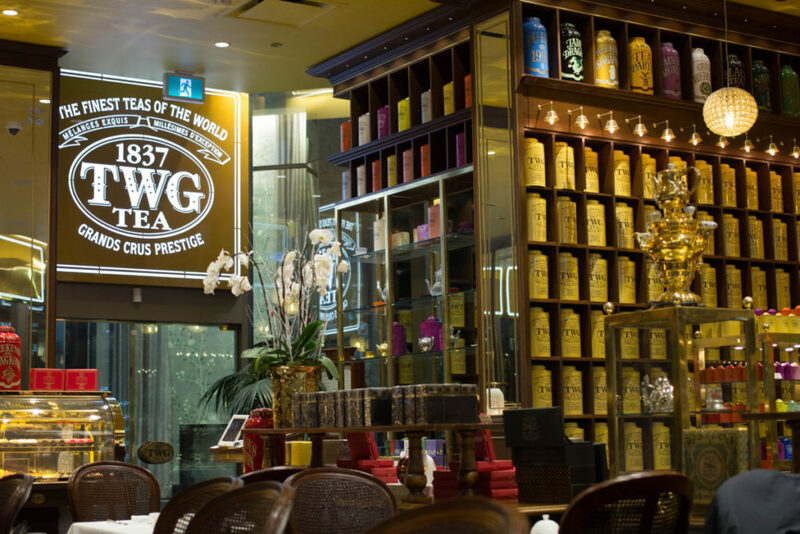 Did you know that TWG Tea in downtown Vancouver is the first and only TWG location in all of North America? As a tea lover, I was ecstatic to know they’re in town and I’ve always wanted to try their high tea sets. And not until recently did I know they actually served a full breakfast, brunch, lunch and dinner menu as well! When speaking to the chef, it’s apparent that a lot of people are like me and have not heard of their full food menus before. 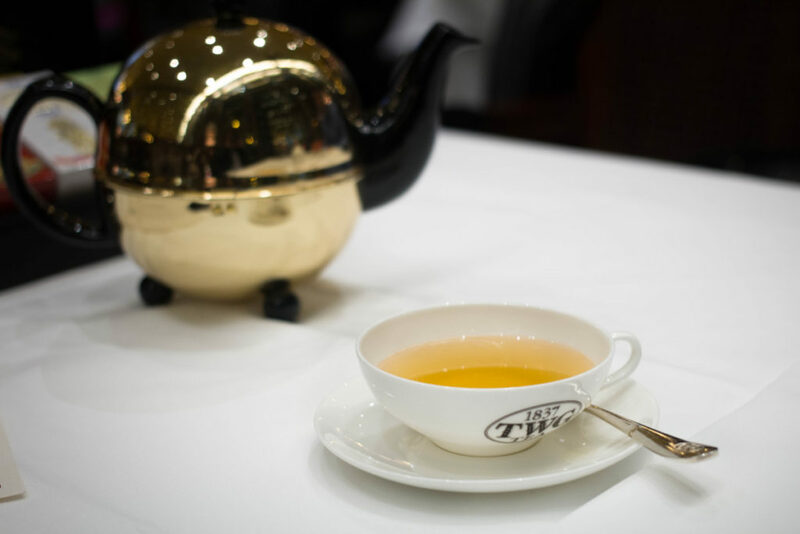 So in an effort to expand this knowledge particularly about their dinner service, they have decided to participate in Dine Out Vancouver 2018 with a special “The Art of Tea Gastronomy” event! It runs on January 19th, 20th, 26th, 27th & February 2nd, 2018. 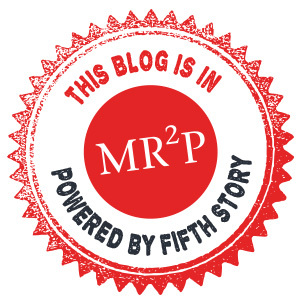 I was invited to give their DOV 5-course tasting menu a try and believe me when I tell you, it was an absolutely spectacular experience from beginning to end. 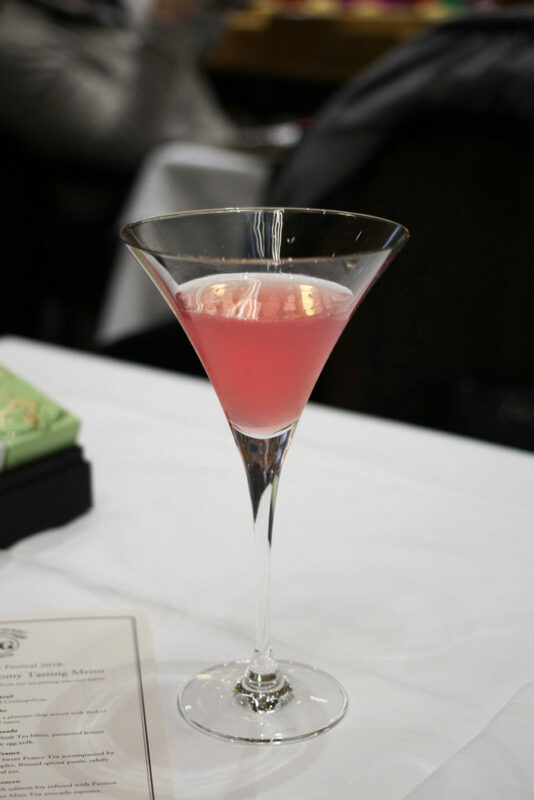 I started off the meal with a Welcome Cocktail which was essentially a Pink Flamingo Tea infused Cosmopolitan. It was surprisingly light and didn’t taste very alcoholic (which I’m sure a lot of girls would appreciate). Meta Knight didn’t try the DOV menu but got the Matcha Nara ($21) to start. 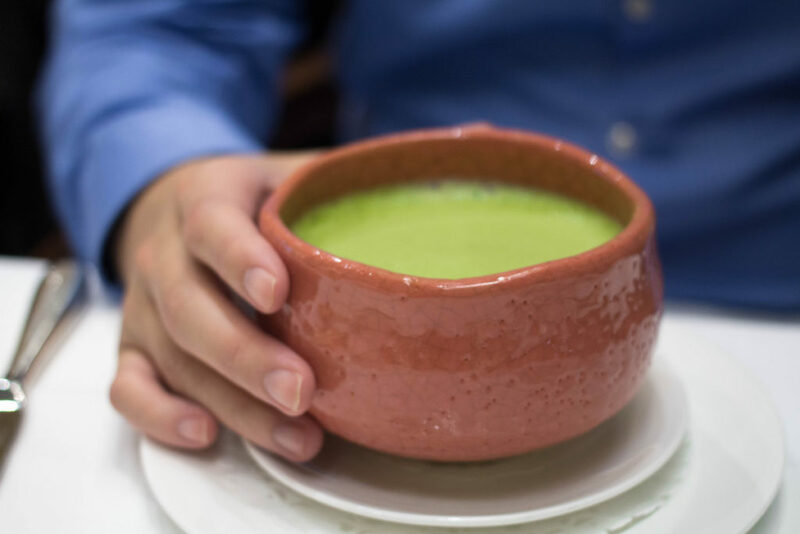 It was whisked and served in a traditional matcha bowl (chawan) without any milk or sugar. I on the other hand got the 1837 White Tea. It had some light floral notes as well as a lingering aftertaste of berries. 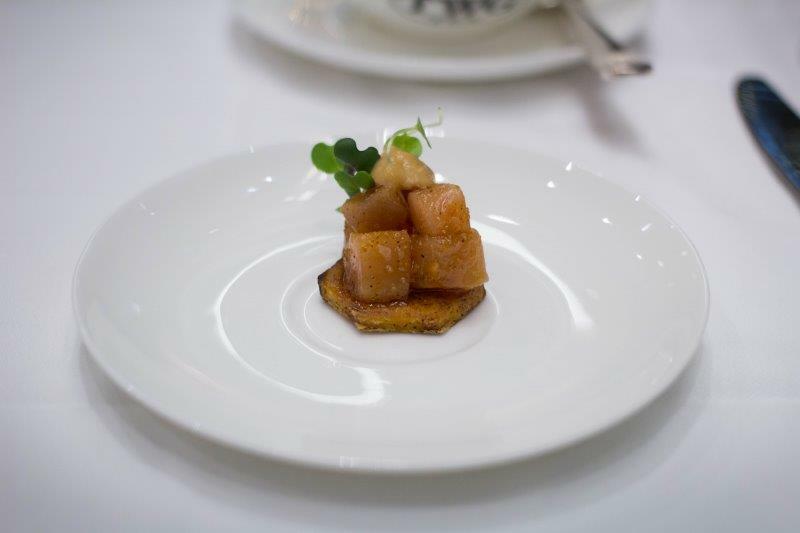 Inspired by Ethiopia, it contains spiced albacore tuna kitfo on a plantain chip served with Red of Africa Tea moambe sauce. It was a delicious one-biter and the Ethiopian spices lingered as a spicy aftertaste. 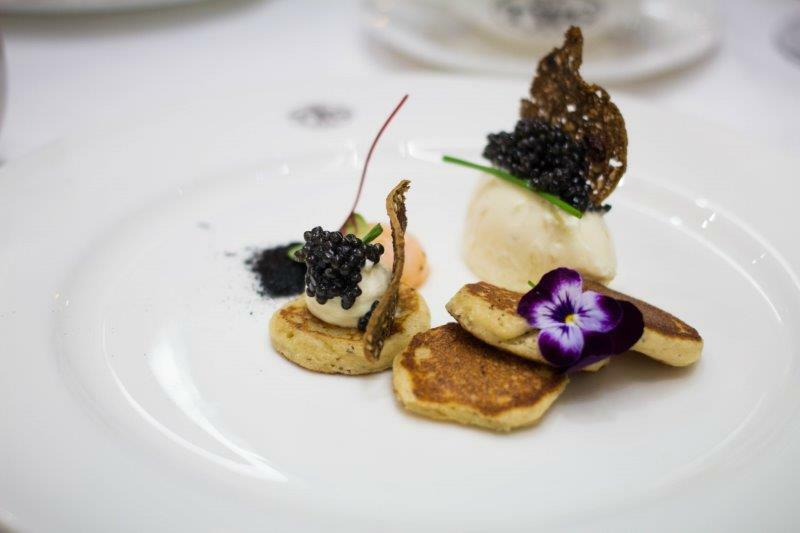 Northern Divine Caviar served with Lemon Bush Tea blinis, preserved lemon creme fraiche, and confit egg yolk. I’ve had a dish similar to this once in Las Vegas and I can tell you this was 10 times better than that. The confit egg yolk was a luxurious ‘sauce’, if you will, that coated the caviar perfectly with every bite. This was the venison loin and crispy sweet bread infused with Sweet France Tea, accompanied by a chestnut flan, calvados macerated Parisienne apples, brussel sprout puree, salsify and a foie gras jus. The venison meat was tender as can be and the sweet bread was very delicious with the puree. 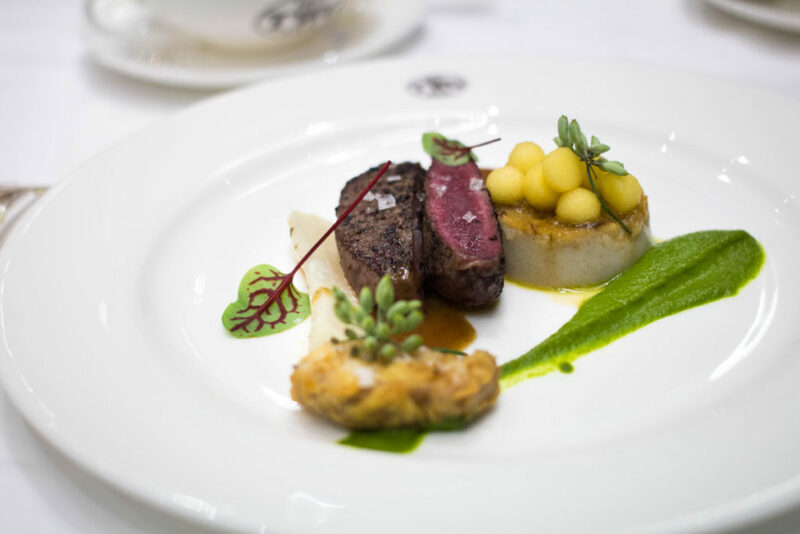 The overall presentation of this dish was beautiful, and I appreciated the meticulousness of everything from the mini parisienne apple balls, to the large flaked salt on top of the venison, everything seemed very well thought out. 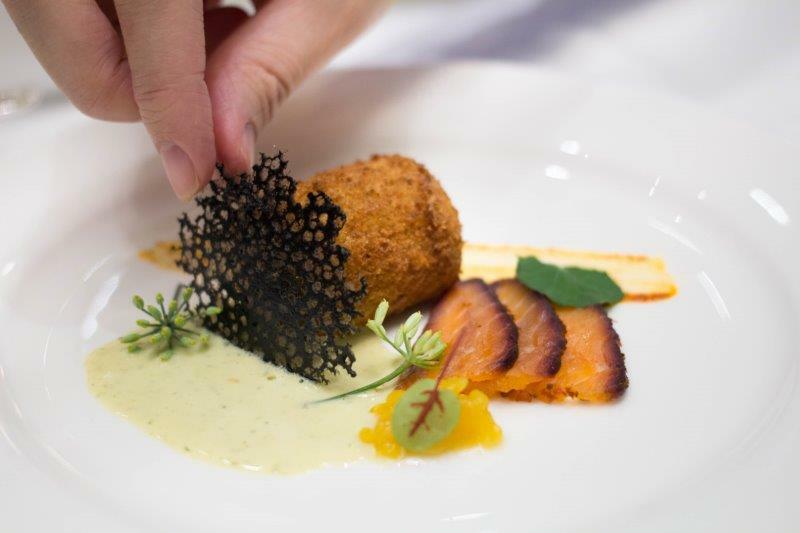 This dish consists of a dungeness crab and pacific octopus croquette, salmon lox cured in beets, passion fruit caviar, squid ink tuile, and a Moroccan Mint Tea avocado espuma. I couldn’t taste too much octopus in the croquette but the fresh dungness crab meat really shined through. 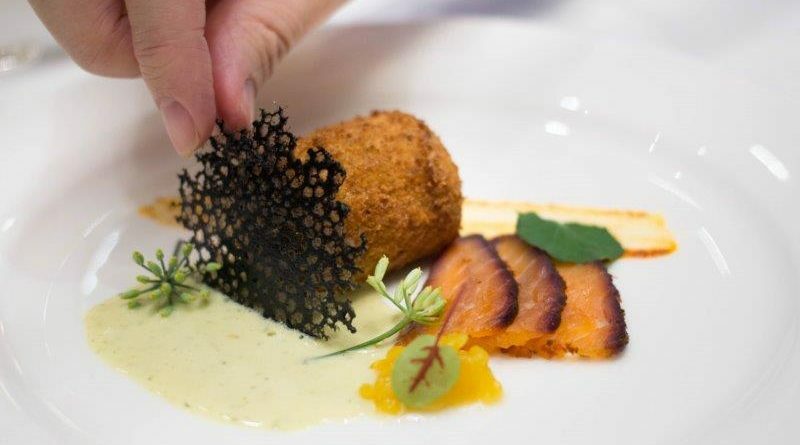 The salmon along with the spices, sauce, and passion fruit caviar? Gold. Now this was the dish that I was waiting for. If you follow my blog, you may know that my absolute favourite ingredients include ikura, uni, and lobster. I love those ingredients so much in fact that I made an Uni Pasta dish for Meta Knight’s birthday a couple months back! My recipe for it is here. 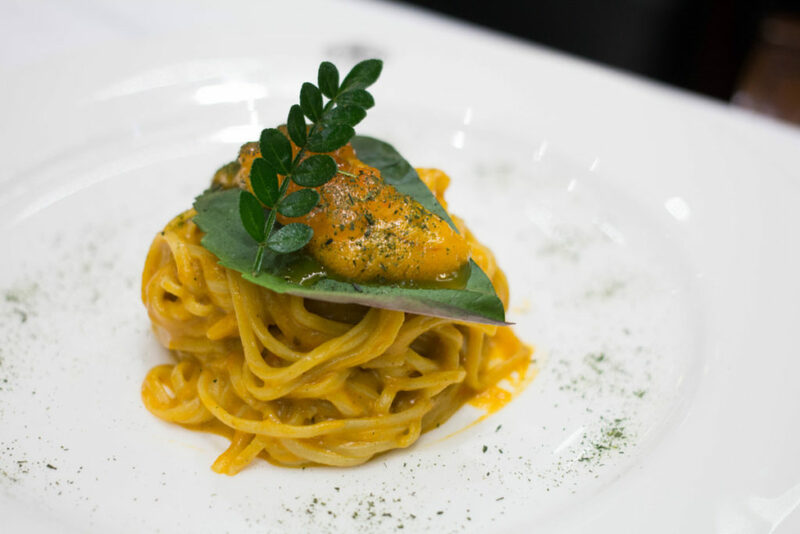 🙂 This fresh capellini pasta with enriched lobster bisque, served with fresh uni, ikura, and matcha dust was obviously incomparable to mine. It was velvety smooth, rich in lobster flavour, and bursting with umami flavour in every bite. If they end up serving this on their regular dining menu, I will gladly come back and eat it again! I’ve had coffee affogatos, beer affogatos, but never a tea affogato before!! 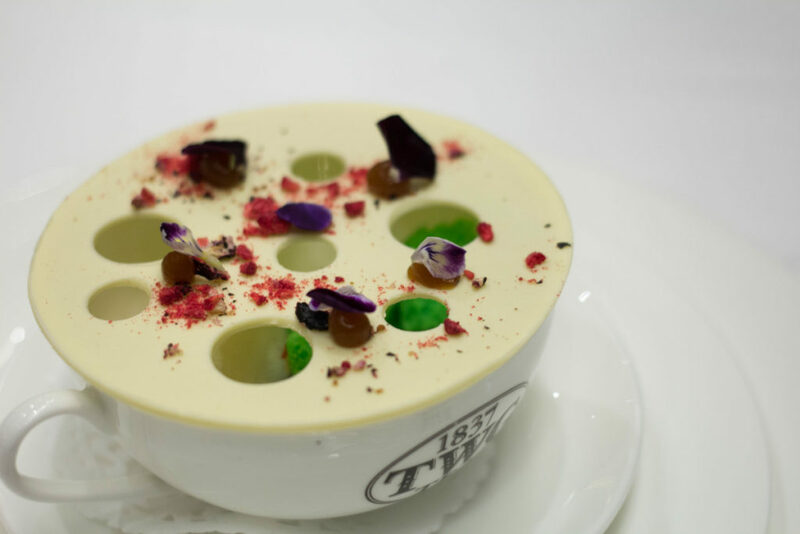 This dessert comprised of a Weekend in Singapore Tea poured over a ice cream with coconut soil, pandan moss, anise gel, and white chocolate on top. The result was very interesting. We both at first were confused by the texture and the taste, but ended up slowly enjoying it and eventually finishing the whole dessert. In the end I think I still enjoy coffee affogatos more, but this was a very unique take on a traditional dessert. 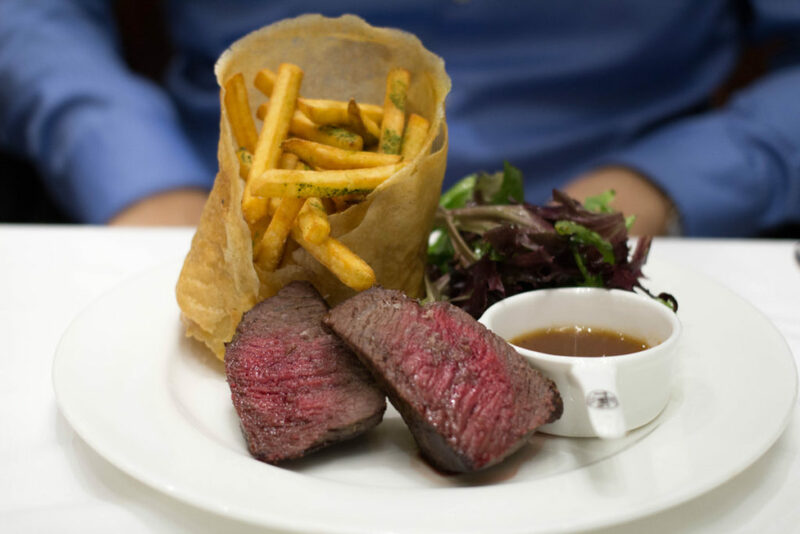 Off the regular dining menu, Meta Knight ordered the Wagyu Beef Steak ($35) which included a 400 day grain fed wagyu steak served with a black pepper sauce, salad drizzled with an 1837 Green Tea vinaigrette, and truffled fries sprinkled with matcha powder. One of the most interesting things about this dish was that the container for the fries was made of phyllo! 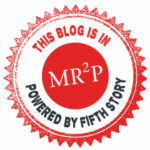 Talk about originality! Meta Knight overall really enjoyed the dish and he said each bite of wagyu was incredibly buttery. 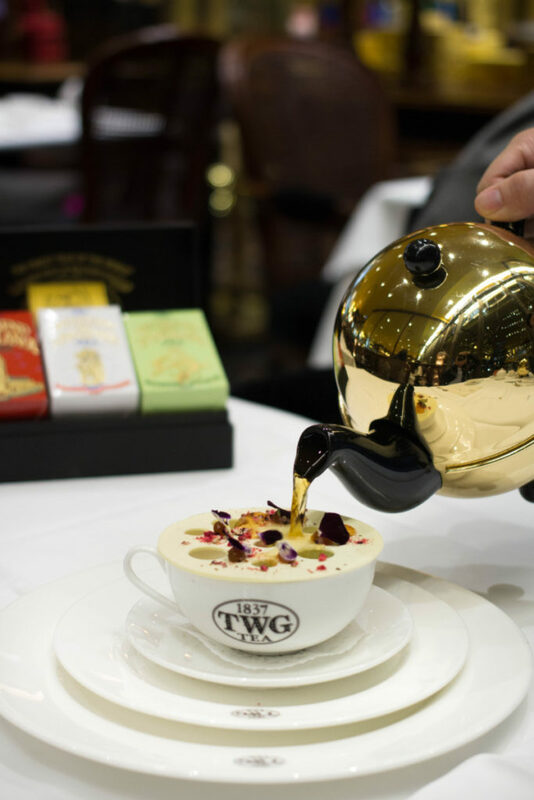 All in all, we were both pleasantly surprised by the level of quality TWG provided when it came to their food offerings. I truly did not know they had such an extensive food menu and now that I know it’s executed so well, I’ll definitely be back for brunch or lunch. Their prices are comparable to hotel restaurants like Honey Salt or Yew which is fine as the ambiance and service is top notch as well. 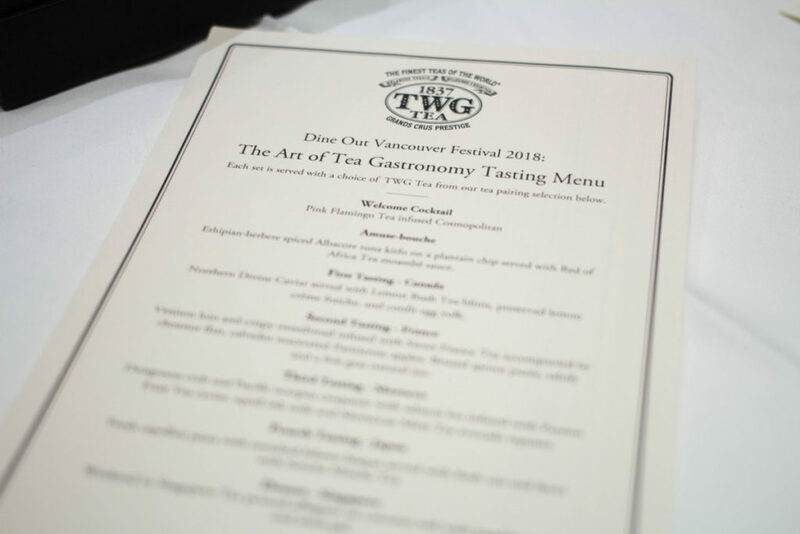 You can purchase tickets for their “Art of Tea Gastronomy” event here. 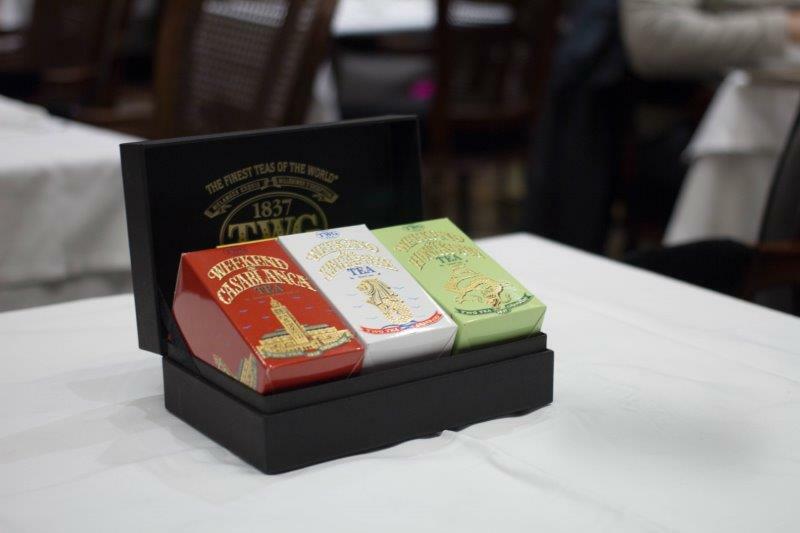 Want to win this TWG Weekend Collection Trio Set ($100+)? Enter my Instagram giveaway for your chance to win! This contest is open to all Metro Vancouver residents and will run from now until Tuesday January 23rd, 2018 at 6pm. 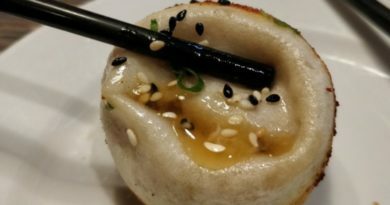 Disclosure: I was invited to try their Dine Out Vancouver menu and all food/drinks were complimentary. All opinions are my own. 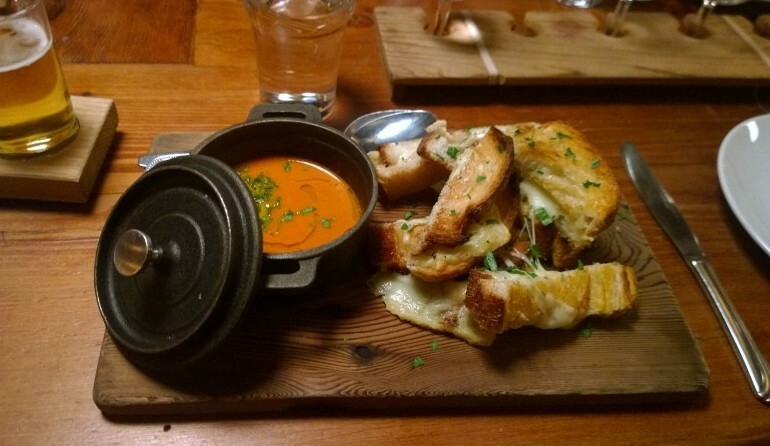 The Belgard Kitchen – Grilled Cheese and Tomato Fondue is Da Bomb!